Defrost the shrimp if frozen and peel the shell. Devein the shrimp. 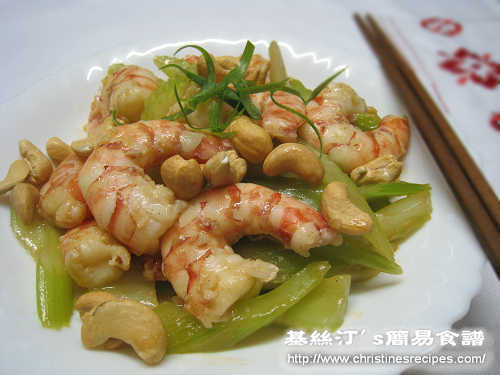 Mix shrimp with a bit of salt and cornflour, and leave for a few minutes. Rinse thoroughly with cold running water. Drain well and Pat dry the shrimp with paper towels. Marinate the shrimp with a bit of salt, white pepper, egg white and corn flour for 20 minutes. Rinse celery and cut into strips. Set aside. Add cooking oil to wok, sauté shrimp on medium heat until 80% cooked. Dish up and set aside. Add 2 tablespoons of oil to sauté minced garlic. When you smell the aroma of the garlic, add celery. Sprinkle with wine and a pinch of salt. Quickly stir well. Add chicken stock to cook for a while, uncovered. Toss shrimps back to wok and cook, add thickening. When sauce begins to dry up, add roasted cashews. Dish up and serve on a platter. Enjoy! 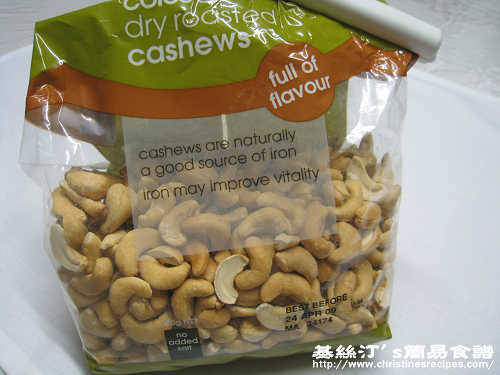 You can get ready-made roasted cashews at supermarkets or do it by yourself. Bake raw cashews for about 10 minutes or until lightly brown in a preheated oven at 180C. I was really happy when I recently found your blog. I love how your recipes appear so simple but taste so good and homey. You remind me a lot of my mom who loved cooking for me when I was a child. Whenever I visit home I always bring a list of her dishes that I miss the most. Thank you for posting these recipes online along with the helpful pictures. I really appreciate it! I'm very happy to know that you love my home cooking style. Your mom must have been very happy to have you enjoying her cooking. I'll keep posting some of my favorite recipes here. Welcome you to come back for more. Hi Christine, im a fan of your blog and had experimented a few recipes which my family really love! Thank you for sharing! To cook chicken stock, use the whole chicken to cook with veggies. You can remove the meat for later use. Very often, I use Campbell's chicken stock or Swanson broth for quick fix. Christine... how come you need to leave the shrimp in cornflour, then rinse, then cornflour again?? 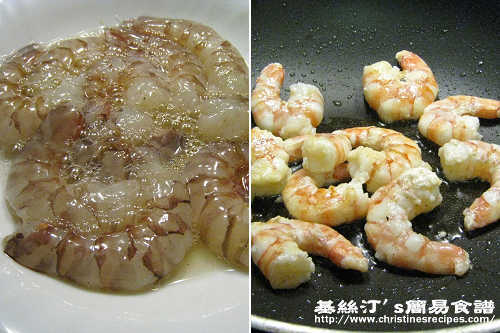 To make the texture of the shrimp meat become smoother and more springy by doing so.